Tip: You can make up for the stock materials by putting more focus on the accessories. Splurge on a nice light fixture or cabinet hardware. “Accessorizing will draw the eye more so than the type of tile you have, especially if you put up a shower curtain that hides it all anyway,” says Little. Designer Louis Cook of PerfectView Remodeling says this bathroom falls into the basic bathroom remodel range. It includes a 24-inch vanity, a low-end granite countertop and a typical fiberglass bathtub-shower unit. The clients splurged on large-format, 6- by 36-inch tile flooring that resembles wood. This put the project’s total cost at $12,650, Cook says. Without the material upgrade, Cook says it would have been around $10,500. Here’s another one of Cook’s bathrooms that he puts in the basic category, between $10,000 and $11,000. The vanity has a single undermount sink and a granite countertop. And the shower is an off-the-shelf fiberglass insert unit. $10,000 to $35,000Why the broad range? Well, location, materials, cost of labor and project scope play into it. For example, according to the HouzzReal Cost Finder, the average bathroom remodel in New York costs just over $32,000. In Mississippi it’s just under $14,000.What you might get: Better fixtures, like a toilet with better flushing capabilities or faucets with better flow. And new features like flooring, a vanity, a sink, lighting, window treatments, hardware, a comfort-height toilet, a 36-inch countertop, a framed mirror that matches the vanity and a recessed medicine chest — all of which are slightly better quality than from a big-box store.Plus, you can make a few more adjustments to the layout. 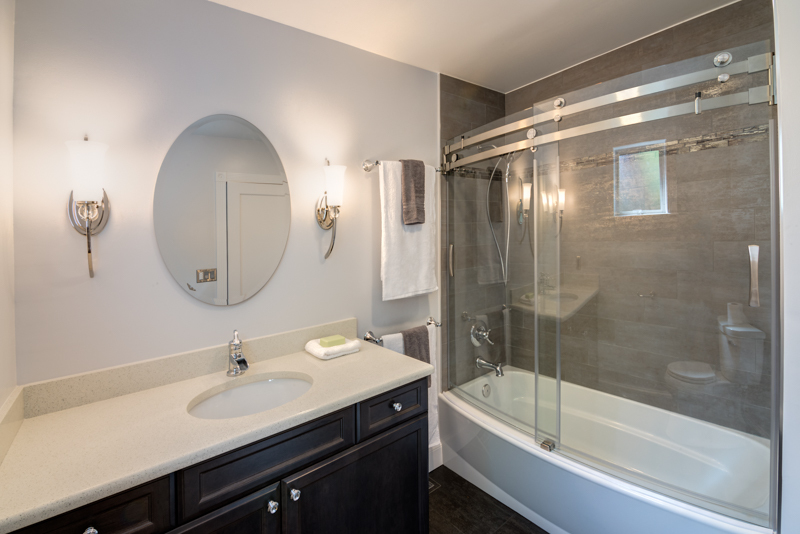 Maybe you’ll put in a slightly smaller bathtub to make way for a slightly larger shower. Maybe you’ll slide a sink down and move the plumbing slightly to add a tall linen cabinet.Countertops: A higher-grade remnant or custom piece of granite, marble or quartz. There’s also a fully enclosedsteam shower with an integrated bench. Here’s another one of Little’s projects that cost around $30,000. The space is clad in porcelain tile. Frameless glass encloses the shower. The vanity is semicustom, and the fixtures are chrome. Who to hire: You’ll likely have a team that includes a designer, plumber, plasterer, tiler, painter and other specialists. “It’s not going to be just a Joe of all trades,” Reynolds-Poulin says. This level requires permits. The example shown here, by Case Remodeling, falls into the deluxe category. The cost was around $75,000, and it features radiant floor heating, natural stone tiles, a custom-built vanity and polished-nickel fixtures. There’s also a freestanding tub with a freestanding faucet. Reynolds-Poulin’s project here is another example of a deluxe project (though he considers it midrange). The cost was around $48,000. He removed a fiberglass shower; took out a washer and dryer; moved the toilet, bathtub and sink to different places; and added heated floors. Because this is the only bathroom in the house, it’s used not just by the homeowners but by guests as well, and so they were willing to put a little extra love into it. The walls are real wood beadboard with deep molding. The windowsill is marble. The fixtures are polished chrome with porcelain handles. The toilet cost more than $1,000 alone, says the designer. He suggests you can save money by checking out granite yards and stone yards for remnant pieces. “You might find a 36-inch piece of granite left over from someone’s kitchen project and use it for the threshold in the shower doorway,” he says.